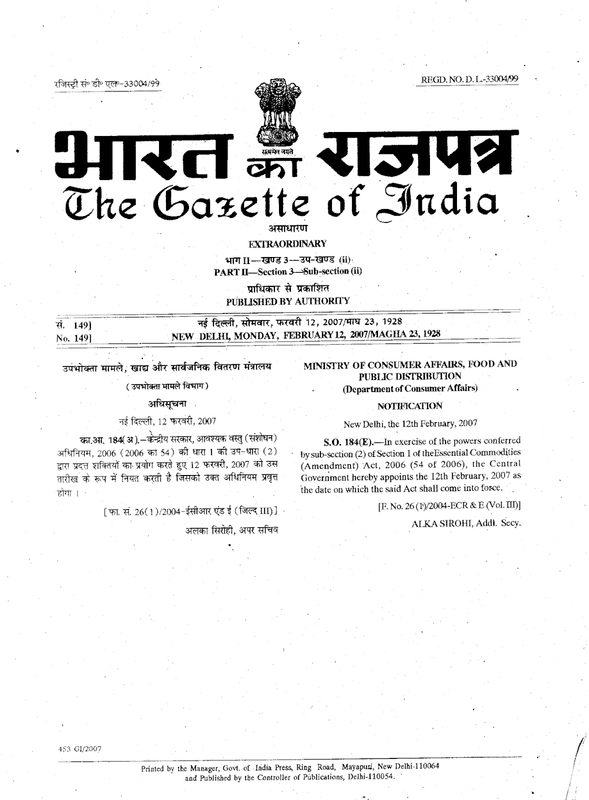 The following Act of Parliament received the assent of the President on the 24th December, 2006 and was published by the Ministry of Law and Justice (Legislative Department) in the Official Gazette of India (Extraordinary, Part II, Sec. 1) by Notification dated 26th December, 2006. 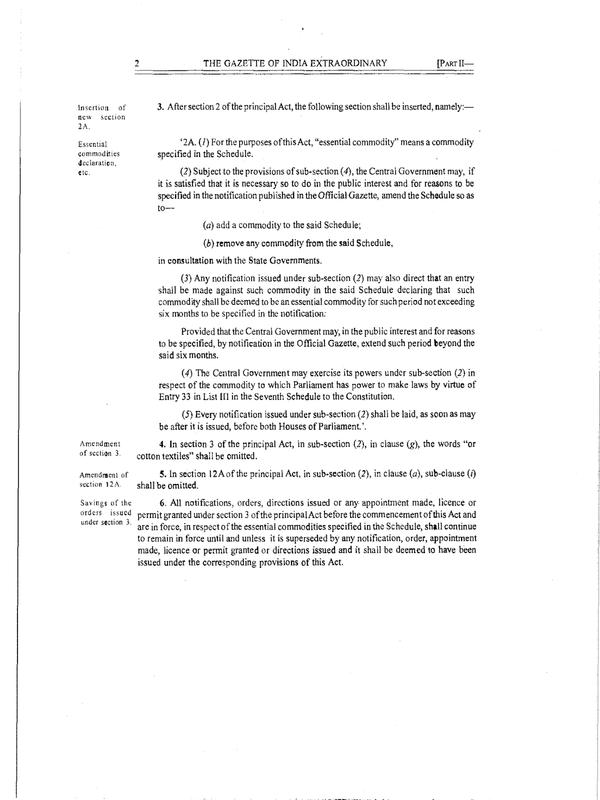 An Act further to amend the Essential Commodities Act, 1955. (1) This Act may be called the Essential Commodities (Amendment) Act, 2006. (2) It shall come into force on such date as the Central Government may, by notification in the Official Gazette, appoint. In the Essential Commodities Act, 1955 (hereinafter referred to as the principal Act), in section 2, clause (a) shall be omitted. 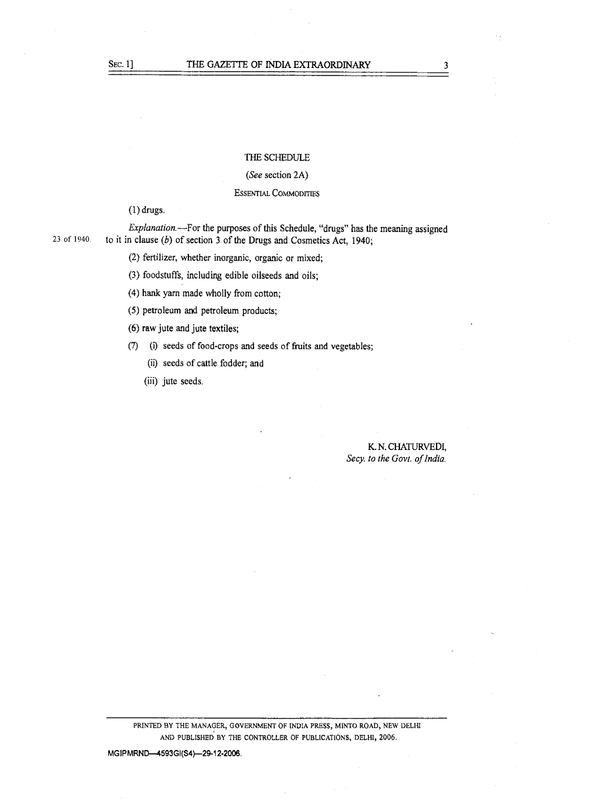 (1) For the purposes of this Act, "essential commodity" means a commodity specified in the Schedule. in consultation with the State Governments. Provided that the Central Government may, in the public interest and for reasons to be specified, by notification in the Official Gazette, extend such period beyond the said six months. (4) The Central Government may exercise its powers under sub-section (2) in respect of the commodity to which Parliament has power to make laws by virtue of Entry 33 in List III in the Seventh Schedule to the Constitution. (5) Every notification issued under sub-section (2) shall be laid, as soon as may be after it is issued, before both Houses of Parliament.'. In section 3 of the principal Act, in sub-section (2), in clause (g), the words "or cotton textiles" shall be omitted. In section 12A of the principal Act, in sub-section (2), in clause (a), sub-clause (i) shall be omitted. 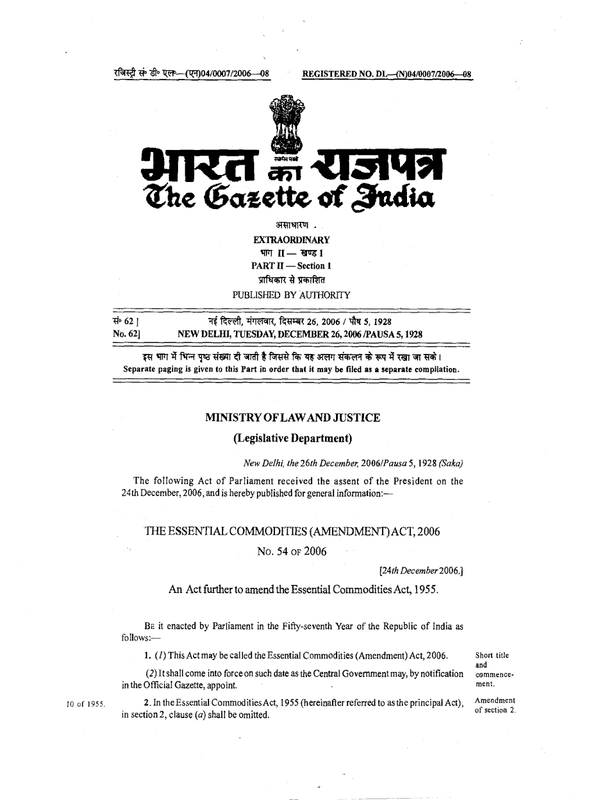 All notifications, orders, directions issued or any appointment made, licence or permit granted under section 3 of the principal Act before the commencement of this Act and are in force, in respect of the essential commodities specified in the Schedule, shall continue to remain in force until and unless it is superseded by any notification, order, appointment made, licence or permit granted or directions issued and it shall be deemed to have been issued under the corresponding provisions of this Act. The Essential Commodities (Amendment) Act 2006 came into force with effect from 12th February, 2007.